I don't know who is messing up between Komputerbay and Amazon but the product does not look like the picture. Specifically the card reader. I contacted both and got refunded. Why? Because on this picture, the SD card reader looks pretty good but what you receive is the cheapest reader one can find. It works! Formatted in a Samsung DV300F camera and it works so..... what else can you say. Oh' did come with the mobile reader which I love to use in the car's USB stereo under .mp3 as well as the regular size SD card which we use in our Nikon 40x Digital SLR Camera. I was looking for a 32 GB micro SD card, when I found these at Amazon. The price was competitive and the shipping was fast. Good value Review by D. MARTIN "Faither"
Works well and won't bust your budget Review by J. R. "Monkihead"
Bought this for my Samsung Galaxy S3 and it worked perfectly. Plug in and recognized it immediately. The card seems to be very suitable. The USB reader, however, is not what is shown in the listing. The pictured reader looks fairly substantial, but the one I received is very cheap. In fact, it broke the first time I used it, so does not work. I paid a little extra for a card just to get the reader. That was a mistake. Great seller! Highly recommended Review by D. Elton "Sectoid"
great item. works as needed. Will order again, if I am in need of another. Works As It Should Review by Food & Books "What else do you need?" Good product and prompt delivery at fair price. Exceptional Memory Card Review by R. Hebshie "@RONTHINKblog"
The first one I bought was for me and my samsung GS3. Worked flawlessly and the mini adapter was perfect; just what I was looking for. USB port for a mini sd card. I was able to transfer pictures and files from other cards without having to put them in and out of my phone. 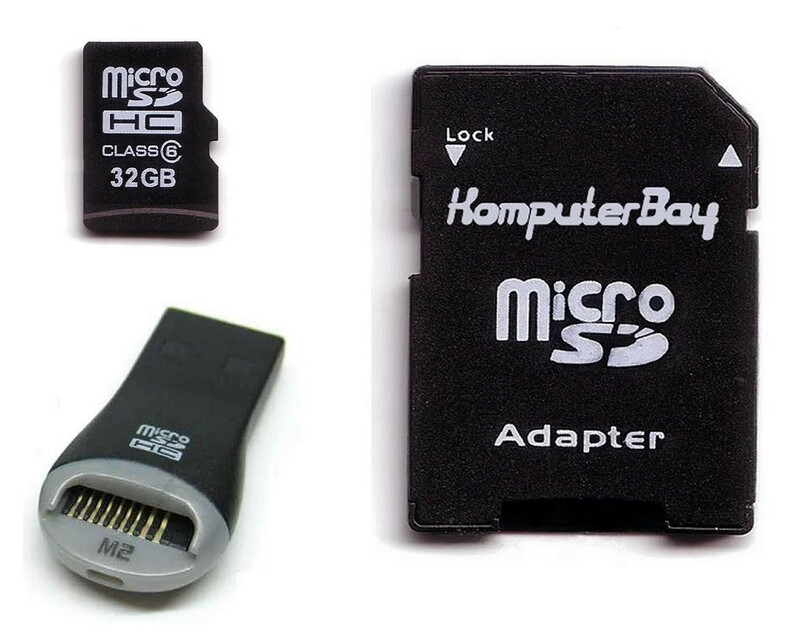 THE MICRO SD CONTAINS 16GBS WORTH OF SOMEBODY ELSE FILES THAT ARE WRITE PROTECTED. CANT DELETE . CANT USE. Great capacity Review by Ivan "Too big to fail"
Seems to be a great value! Review by D. Vukosic "Darth_Vukster"
I had Review by Jake J. "Jake J." I read online that the Samsung Galaxy products (I have a Note 10.1 and S4 Active) don't do as well with UHS Micro SD cards, and seem to like Class 6 best. The 64gb ones are all Class 10 UHS, which makes sense. So, I looked for the highest capacity I could find that wasn't UHS (Class 6 or Class 4) and found this card. Brand Name isn't everything. This item performed as well as other pricier cards I have. memoria Review by juan alvarez "juan jose"
Good product for memory and speed! Review by BLESS THEE "Manahuna"
I expected to receive Komputerbay brand card, but what I got is Samsung. It is what I needed so I have no complaints since it works perfectly. It is also convenient to have the adapter and the reader. Is this a joke?! The item wasn't even in the box. It looks like it was used before!!! And the USB plastic cover is broken! Do you really think that people ordering from you USED Micro SD for $31.35??? Shame on you guys doing this to people. Never wanna hear about your company again. My husband got me this for Christmas, to go along with my new Samsung tablet. For 9 months, it worked just as expected, no problems. Suddenly last week, my tablet couldn't find my music and it was running very slowly and applications weren't working. I went into my tablet settings to see what it showed for storage on my SD card (which, by the way, hadn't been removed at all in quite a long time, hadn't been played with or poked at or popped in/out at all - it had been left alone to do the job it was bought to do). Tablet showed no SD card was present. I plugged SD card into the adapter and put it in my computer, and nothing showed up - it didn't exist. I tried it one more time in my phone, and still, it was like nothing was there. I tried my phone micro SD in my tablet to be sure it wasn't my tablet SD reader going on the fritz, and it worked just fine. So, bottom line, this card stinks, and I will not buy another KomputerBay product. LUCKILY I didn't keep my tablet's pictures on the SD card or I'd be very angry to have lost those, but I do have to spend a huge amount of my time reloading music and applications and figuring out what else had been saved to the card, not to mention spending a bunch of money on a new SD card when the card I have should still be working. I guess you get what you paid for. The card is working, but very slow on a large transfers (over 2 Gb or so). I think once internal cache buffer is filled, then it takes a long time to finish copying. The reader is plain non working - it mounts and dismounts at a rate few times per minute. I tried it on two home computers and one PC at work - same result. Doesn't stay mounted long enough to even copy a small single file. Perfect for my dash cam, Review by Michael P.
The price for the service Review by grayduck "quack quack"
Good Product, Review by R. J. Jackson "music addict"
Works perfectly in my wife's Android tablet Review by D. H. Leake "dhleake"
was looking for an inexpensive 32G card for a dashboard cam. The reviews on the camera said it worked better with Class 6 cards instead of class 10 so that factored into picking this one. I have had it now for about 3 weeks and it works fine in the camera and in my computer to retrieve images. It works perfectly Review by Brett Dallas "Big D"
I bought the 32 Gbyte class 6 micro SD card with the SD card adapter and usb adapter. It works very well in my camera (which specifies a class 6 SD card). It also works well with my computer, both with the SD card adapter and with the usb adapter. I'd not heard of Komputerbay before but I believe that computer memory is now a commodity - so why pay more for a well known brand name? The card works fine and I have since bought a second. Both cards were delivered quickly and work well. Fine Card Review by Shannon R. Fredericksen "Da' Man"
ordered the Samsung MicroSDHC 32GB Class 6 Memory Card with the USB card reader and SD card adapter for a yet to arrive dash cam. The card arrived as expected. 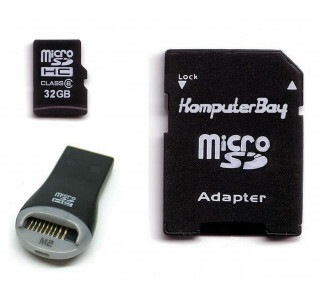 The micro SD card and the SD card adapter function/are recognized by a computer. The Mobilemate USB Reader is functionally ornamental; it DOES NOT function at all. I sent a message to the seller, no reply yet. From several other reviews it appears the USB adapter is only ornamental for other buyers also. Ordered two sets of these from Komputerbay. The cards worked fine but readers didn't. I didn't worry too much about it since the cards were what I needed, although I liked the idea of the tiny USB readers. I just let it go. It works when I install to my samsung tab 3 10.1. Packing was good and sjhipping on time. Good purchase, works fine Review by DDS "Lee"
The memory card and card readers worked exactly as expected, no surprises. I used both the USB and SD card adapters and both worked perfectly. The quality for all three items seems great. Works in my dashcam Review by C. R. Hulen "Howie Human"
Better than expected. Review by Harley Dixon "AgelessWings"
Works Great Review by J.W. Cooper "Jackson Cooper"
I plugged this MicroSDHC into 2 different computers and it did not work. It is not visible in both of computers. I also inserted it in my Car DVR Vehicle Camera and camera shutted down. Great memory cards at a great price. These cards were able to fulfill my requirements to a T.
I would recommend this seller to anyone in the market for MicroSD memory cards.